A fascinating example of a science discovery that will lead to a great conceptual design for lithium-ion batteries is in the article, “Tiny Capsules Can Heal Worn-Out Batteries” posted on “Wired Science” on February 22, 2011 at 10:22 am. My interest in this advance is twofold: (1) such microspheres might solve a critical weakness of lithium-ion batteries, fires; and (2) these microspheres provide a great opportunity for what I call “adaptive” or “biological” design. “Adaptive” designs use materials with properties that change based on some variable: temperature, pressure, proximity to chemicals (including proteins), and so on. The use of such materials allow engineers to develop products that respond to environmental changes, as described in the article referenced below. In the article, Devin Powel of Science News writes, “Damage to a battery — or a short circuit between its components — can cause problems other than a shorter life span. Out-of-control electrical currents have been known to create hot spots that grow into a raging fire. ‘It’s not a common occurrence, but when it happens, the consequences are severe,’ Scott White said. This is one example of “adaptive” design where engineered materials adapt or react to their changing environment much like biological entities. Elaborate and expensive control systems aren’t necessary in adaptive designs. Avoidance of critical failure modes is built-in. Consistent function is provided to the user in a customized manner. The challenge now, as it is in many of such “adaptive” material breakthroughs, is to develop products that provide the most stable performance in varying conditions at low cost. 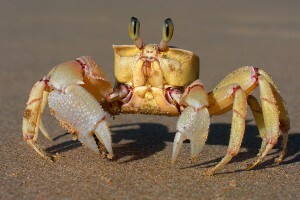 While we’re a long way from developing anything as adaptive as the ghost crab in the picture, engineers now have a chance to change their pespective. They now create devices that react to their environments providing better and safer performance to every customer. Technical people create designs that move toward the goal of providing a unique experience tailored to need of every individual customer – custom-made, mass-produced products.